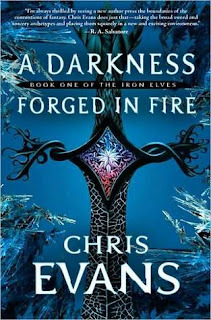 Writer's Block: A Darkness Forged in Fire, Book One of the Iron Elves, by Chris Evans. 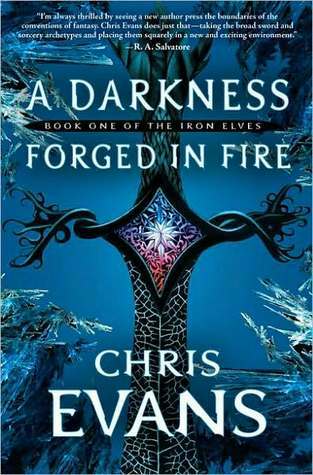 A Darkness Forged in Fire, Book One of the Iron Elves, by Chris Evans. 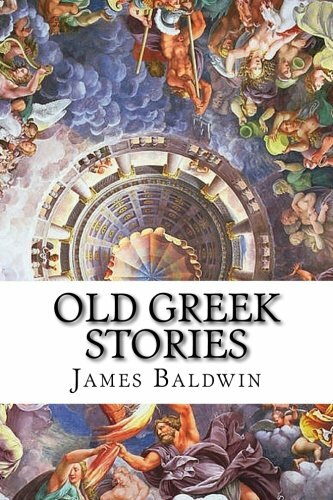 Easily one of the worst novels I’ve come across since William S. Burroughs’ Naked Lunch. Forget character development or story structure for a minute. Let’s consider the basics. Like the musician memorizing scales before building a repertoire for his recital, the writer should familiarize himself with a few common principles long before considering the elements of story or publication. 1) Avoid clichés. Nothing kills your writing faster than tired terms and catch phrases. 2) Be precise. This doesn’t mean use name brands or the metric system. But as Anton Chekhov said, “Don’t tell me the moon is shining; show me the glint of light on broken glass.” Be particular. Instead of a run down of every article of clothing Rob wears, pick one item – his glossy alligator boots. Rather than a list of the furniture in the room, zero in on the Great Dane curled up on the fireplace hearth. A single detail will satisfy the reader’s curiosity about the cowboy’s outfit or the den’s décor, allowing him to get on with the story. 3) ‘Economy of words’ could be the single most important principle, because even if the writing is terrible, there will still be less of it. Evans’ novel is over six hundred pages long. If he’d applied this one principle, his novel could’ve told as much if not more in 30,000 fewer words. Consider the difference between He looked over and saw Bill smiling and Bill smiled. Imagine sentence after sentence like that, page after page of disheveled prose in need of a buzz cut. Not to single out Chris Evans, but with so many instructional books, workshops, and editing coaches today, authors who commit these rudimentary mistakes deserve every bit of ridicule the rest of us can muster. The more time the writer is willing to spend drafting, redrafting, and editing his work, the less time the reader is forced to spend reading it. Essentially, say all you want, but use as few words as possible. You get the idea. If only writers like Evans did.